Concrete floors are typically pretty uninspiring. You might not think that there are many options for making them look good – let alone any options for decorating them. You might think your best option is just to throw a rug over them. However, that’s not really an option when the concrete floors are in a garage or work space. The rug would just get demolished with the foot traffic, grease, and other debris. Decorative concrete overlay is an excellent option for any concrete floors. An Goodyear epoxy coating is applied to the floors, giving them a nice polish and protecting them at the same time. Dyes and other materials can be added to the coatings to change the color of the floor, to add a subtle tint, or even to create a pattern or a unique texture. Never underestimate the power of curb appeal. The way people feel about your home when they look at it will go a long way toward determining its value. So, if people enter your home and see vinyl floors, laminate countertops, or stained concrete, they are going to think your home is cheaply made and poorly maintained, which is going to lower its value. Refinishing your concrete floors with a decorative concrete overlay or even a plain coating will make them look beautiful and sophisticated. Instead of a dingy concrete floor, you will now have a professional-looking floor that they would expect to find in a commercial garage. They will see your home as a high-end property that has the best finishes and that has been maintained with care. Potential homebuyers aren’t just looking for a beautiful space – they’re also looking at how much maintenance the home will require. Sure, they might love the way that big yard looks, but they don’t love the thought of mowing the grass or watering it all year long. Just like they might also love the look of those bamboo floors, but they don’t want to keep up with the cleaning requirements. Concrete floor coatings in Goodyear make your concrete floors easier to maintain, which makes your home more attractive to buyers and improves its overall value. The floors just need a simple sweep and mop to keep them looking good. You don’t have to scrub out stains. In fact, the floors are resistant to stains, so you are less likely to have serious problems. Oil, gas, and a variety of other corrosive substances can spill on your garage floors. At a minimum, you’ll get some nasty stains that will be very hard to get out of the floors. But over time, those substances can also corrode the concrete, which will reduce its lifespan. The concrete is more likely to get cracks, pock marks, and other problems that can cause it to degrade more quickly. Applying Goodyear concrete floor coatings will protect the floor. The concrete will have a barrier that will keep these corrosive materials from seeping into its pores. The floors will last longer, which will save you money. Prospective buyers will be willing to pay more for a home that includes these protective measures, knowing that they would have to spend less on maintenance and repair over time. Getting concrete floor coatings or a decorative concrete overlay is not a luxury – it’s an investment that can pay off over time. Not only will the investment improve your enjoyment of the home and reduce your maintenance, but it will also improve the value of your home. Barefoot Surfaces in Goodyear specializes in concrete floor coatings and decorative concrete overlays for garages, patios, and anywhere else you have a concrete surface. Stains, metallic finishes, and other options are available for your floors so you can get the look you want. You can make your drab concrete floors look beautiful and sophisticated. You might even decide that you want to put concrete floors throughout your home! 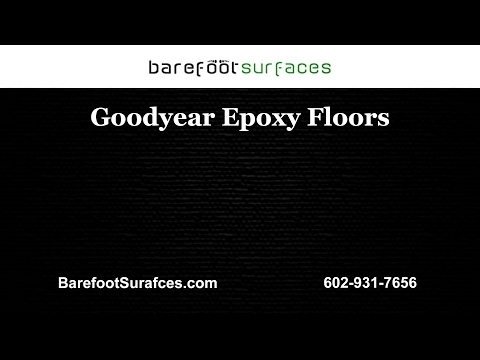 Contact us in Goodyear to get an estimate or to learn more about the work we do.